One of my earliest culinary memories was of eating oysters on the half shell with my parents and other adult family members in a restaurant in Miami. My brother was born in Miami and we lived there for about two tears. I was probably about 4 years old. I have no idea what else was on the night's table but, I remember those oysters in all their iridescent, calcified glory. We ate dinner as the surf broke on the beach right outside the windows, I remember wanting to bring the shells home and looking in vain for pearls overlooked by the shucking crew. The night was totally jet set and I felt very sleek and cool. I guess the oyster was my first and significantly most memorable "Happy Meal". I have enjoyed eating oysters ever since those carefree days. In fact, I'm reasonably sure if the only foodstuff available was the oyster from now until my demise, I'd be fine with that. I have always been an oyster snob and would never seriously consider eating anything but beautiful, raw oysters on the half shell. I mean sure you can rockefeller, stew, or God forbid fry 'em but, why mess with perfection, right? This was always the case, until I moved to California. 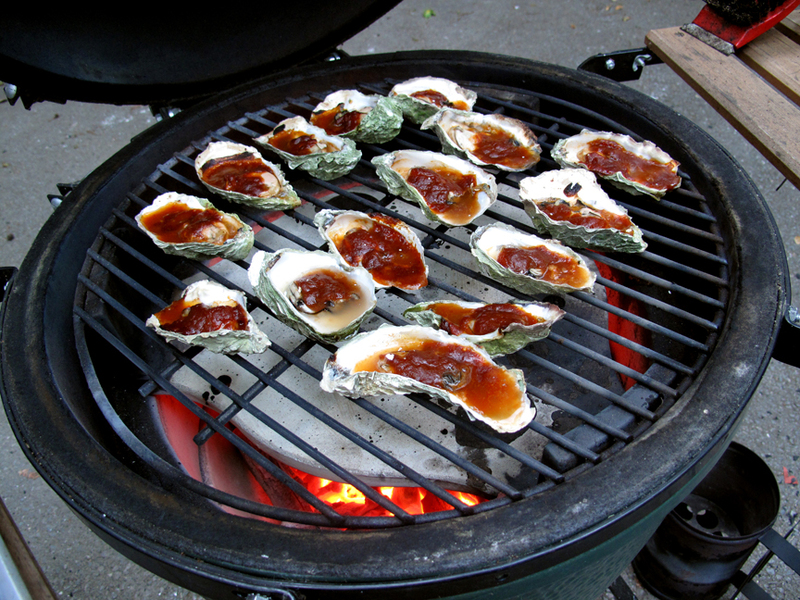 Here the preferred method grill or broil with either a piquant barbecue sauce or a butter and garlic treatment. You cook the little buggers just until they heat through and begin to bubble so, the garlic never really gets cooked. It's like eating a mouthful of raw garlic and not really to my taste. 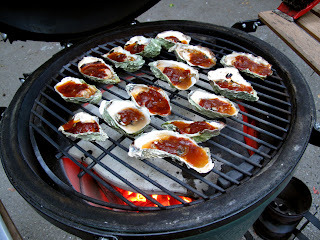 I have to admit the barbecued ones are really pretty damned good however. I think they do it because the oysters grow big around here. 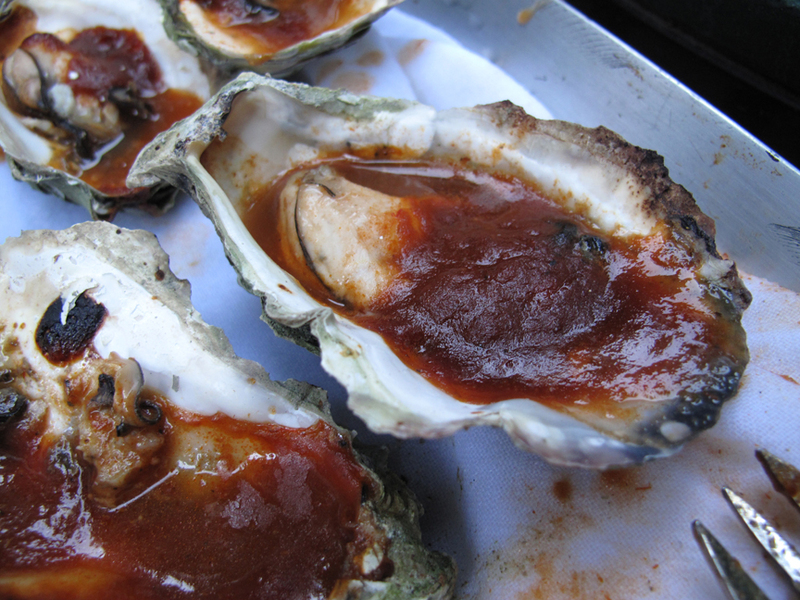 The ones shown in the pictures came from the Tomales Bay Oyster Company . They're the small ones which would be considered large any where else. The large ones are huge. Almost too big to eat. I'm not sure what they do with those guys. My first oyster knife, a brand new Wusthof, lasted through about two dozen large birds before breaking. that was before I figured out that the smalls or extra smalls are the only way to go. The Marin treatment is about as simple as you can get. That's probably why it's good. Don't obfuscate the goodness with a bunch of unnecessary shenanigans! 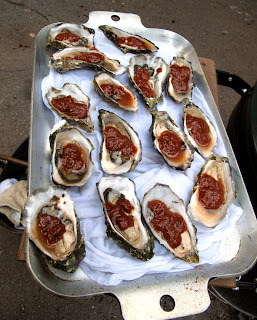 You shuck the oysters, apply a little of your favorite barbecue sauce like Sartain's "The Sauce", and grill (look for a lot more postings pertaining to barbecue equipment like my Big Green Egg soon) just until they start to bubble, maybe 2-3 minutes max. You can accomplish the same thing under a hot broiler in your oven. That's it! That's all there is to it and it's a delicious alternative way to enjoy one of nature's best gifts, even for a snob. You may find yourself a pearl. You'll definitely create a memory!